THIS IS A BEAUTIFUL FRENCH FASHION DOLL. 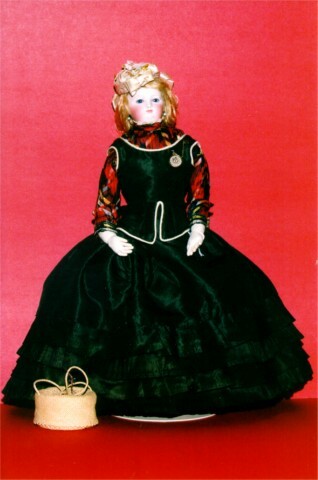 SHE IS BEAUTIFULLY DRESSED IN HER ORIGINAL OUTFIT. SHE IS ABOUT 19 INCHES TALL. 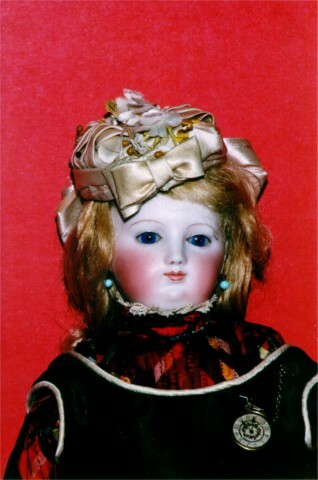 SHE IS UNMARKED, SWIVEL NECK, BLUE GLASS EYES, BODY IS ALL LEATHER WITH GUSSETS AT THE HIPS, PIERCED EARS. SHE IS WEARING A BEAUTIFUL FASHION DRESS AND BLOUSE. THERE IS SOME WEAR TO THE RED PLAID BLOUSE. HER UNDERCLOTHES ARE ALL ANTIQUE AND HER SHOES ARE ORIGINAL FASHION BOOTS. . HER BISQUE IS BEAUTIFUL AND HAS NO DAMAGE OR REPAIRS. SHE HAS A CORK PATE AND AN ORIGINAL MOHAIR WIG. CIRCA 1879-1899.